Sullair, an industry leader in innovative compressed air solutions since 1965, has announced an increased focus on its air treatment products and support. The company has strengthened its commitment by adding a Senior Product Management Specialist to lead its efforts in expanding the existing compressed air treatment business and extending and upgrading the current portfolio. Over the past several years, Sullair has focused on improving its existing line of air treatment products, including dryers and filters. 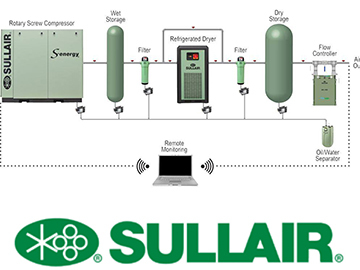 As air treatment becomes increasingly critical to our customers for many different applications, Sullair is expanding its investment to enhance its offerings to better provide customers with complete air compressor and treatment solutions. Today Sullair offers its customers refrigerated and desiccant dryers, filters, oil mist eliminators, oil/water separators and drains to accompany its stationary equipment. Sullair offers refrigerated dryers in non-cycling, digital cycling, cycling and high temperature configurations with capacities from 5-6000 scfm. Desiccant dryers are available in modular, heatless, externally heated and blower purge series, in capacities from 3-10,000 scfm. Sullair offers filtration products for flows 25 to 17,700 scfm and from 15 to 725 psig. Sullair also offers oil/water separators for flows 20 to 3000 scfm, and a selection of drains with zero loss for flows up to 3600 scfm. Users can learn more about the complete Sullair air treatment system by visiting booth #N- 7470 at IMTS, where an example system will be on display, or by contacting their local Sullair distributor. Since 1965, Sullair has developed and manufactured air compressors with proven reliability and wear-free durability. Sullair is globally recognized as a leading manufacturer of portable air compressors, contractors’ air tools, stationary air compressors, compressed air treatment equipment and vacuum systems. Additionally, Sullair provides customers with a full line of aftermarket parts, fluids and services. Sullair has manufacturing capabilities in Michigan City, Indiana; Shenzhen and Suzhou, China; Mahindra World City, India; as well as a JV (IHI-Sullair) based in Suzhou.